It's always exciting to me to stumble across something significant right under your nose. I've been through downtown Sanford quite bit recently, but never seen this building before. I happened to spot these uniquely shaped windows and pulled over to learn more about the building. A plaque near the door identified this as the former PICO Hotel built in 1887. PICO is an acronym for the Plant Investment Company, run by Henry B. 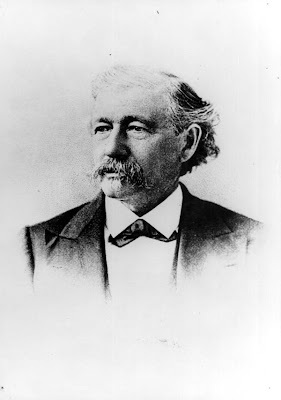 Plant, one of the pioneering railroad barons who helped make Florida accessible by rail to Northern tourists. Plant is best known for creating the railroad that opened up the west coast of Florida, while Henry Flagler established the easy coast as a Mecca for wintering Northerners. 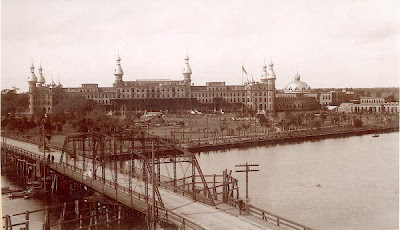 Plant's masterpiece was the Moorish Tampa Bay Hotel, which now houses the Henry Plant Museum and the University of Tampa. The Pico Hotel, described by the plaque as Turkish in style, was the Sanford's terminal hotel for Plant's railroad lines and steam ships on the St. Johns, Florida's largest river. The plaque also describes the windows as having "horsehoe or ogee arches" and a "decorative bartizan tower" that remains today without it's original onion shaped dome. A striped awning used to surround the structure, which was added to the National Register of Historic Palces in 1976. It's my favorite Sanford building - like a mini saracenic prototype for the Tampa Bay Hotel - which started construction, I believe, around about the time this thing was just mid-way to completed. I'm actually a little surprised that you didn't know about it before! But it IS off the main drag in Sanford, somewhat, so it can be a bit hard to spot if you're not looking for it. For a good while this has been home to a catering business - it makes me curious as to what the inside looks like. This is my favorite building in Sanford. When I am rich and famous, I am going to buy it. I'd love to see the inside too. Jodi - when you buy it please restore the onion dome! I never knew this building originally had an onion dome, but it is definitely one of my favorite buildings in Downtown Sanford. It's a shame how run down it's been looking lately though. Next time you're downtown, check out the DMV in the old hospital. They have some great plaster carvings of hospital scenes near the entrance.